Ten Speed Press, 9781607743576, 208pp. This luscious and contemporary take on the alluring cuisine of Iran featuring 75 recipes for both traditional Persian dishes and modern reinterpretations using Middle Eastern ingredients. 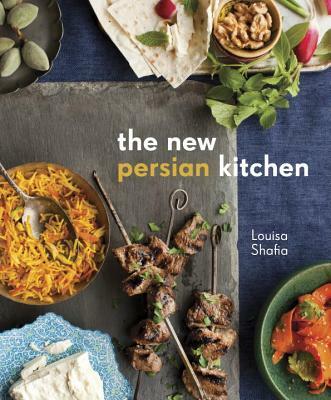 In The New Persian Kitchen, acclaimed chef and Lucid Food blogger Louisa Shafia explores her Iranian heritage by reimagining classic Persian recipes from a fresh, vegetable-focused perspective. These vibrant recipes demystify Persian ingredients like rose petals, dried limes, tamarind, and sumac, while offering surprising preparations for familiar foods such as beets, carrots, mint, and yogurt for the busy, health-conscious cook. The nearly eighty recipes—such as Turmeric Chicken with Sumac and Lime, Pomegranate Soup, and ice cream sandwiches made with Saffron Frozen Yogurt and Cardamom Pizzelles—range from starters to stews to sweets, and employ streamlined kitchen techniques and smart preparation tips. A luscious, contemporary take on a time-honored cuisine, The New Persian Kitchen makes the exotic and beautiful tradition of seasonal Persian cooking both accessible and inspiring. LOUISA SHAFIA has cooked at restaurants in San Francisco and New York, including Millennium, Aquavit, and Pure Food and Wine. She has created original recipes for Whole Living, Food Network Magazine, Prevention, and Better Homes and Gardens and has been featured in Yoga Journal, New York magazine, Every Day with Rachael Ray, the Washington Post, and Saveur. Her first cookbook, Lucid Food: Cooking for an Eco-Conscious Life, is a collection of seasonal recipes that was nominated for an IACP award. Look for her on the Cooking Channel's Taste in Translation series, making Persian kebabs. Learn more about Louisa and watch her cooking videos at lucidfood.com. Every once in a while I pick up a cookbook and want to cook everything in it, which was the case with this one.